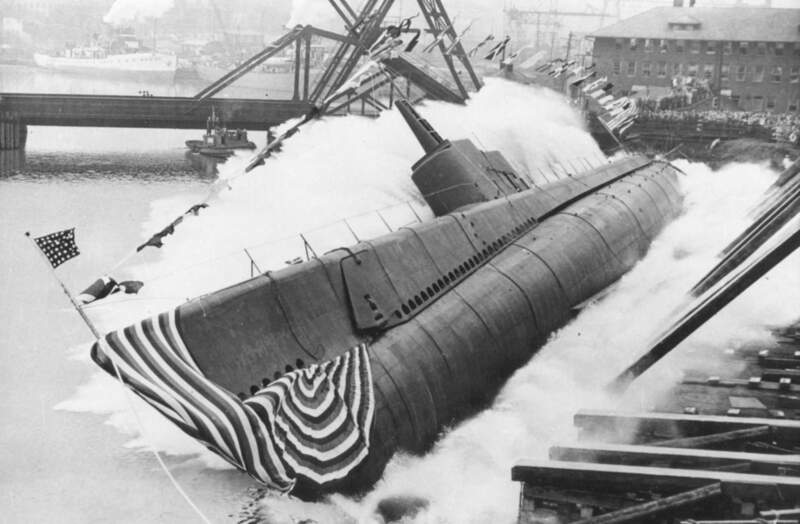 During the Cold War, the United States (U.S.) needed to be able to communicate with its nuclear submarines in the depths of the worlds’ oceans. If they were needed to carry out a preemptive or retaliatory strike against the Union of Soviet Socialist Republics (USSR), communication to the nuclear submarines was critical. Following the end of World War II, political tensions grew (past perfectly normal political relations) between the U.S. and the USSR as each country had different ideas about what political systems should be implemented in Europe. Following a change in foreign policy that replaced the neutrality of foreign conflicts with war deterrence, the U.S. military needed to have an active, ready force that would be ready for war. This also included the buildup and use of any weapons that caused extreme destruction such as a nuclear weapon (Millett and Maslowski 495,496). The U.S. started to look at weapon systems that would be able to survive any type of attack without the loss of function. The U.S. Navy discovered that weapons systems that operated mainly in the ocean waters would be the most resilient. This concept was the basis on why the U.S. Navy enacted the TRIDENT weapons system used on the U.S. nuclear submarines in 1979 (Klessig 4). The U.S. Navy looked at extremely low frequency (ELF) radio transmissions as a way of communicating to these weapons systems from within the country’s boundaries. 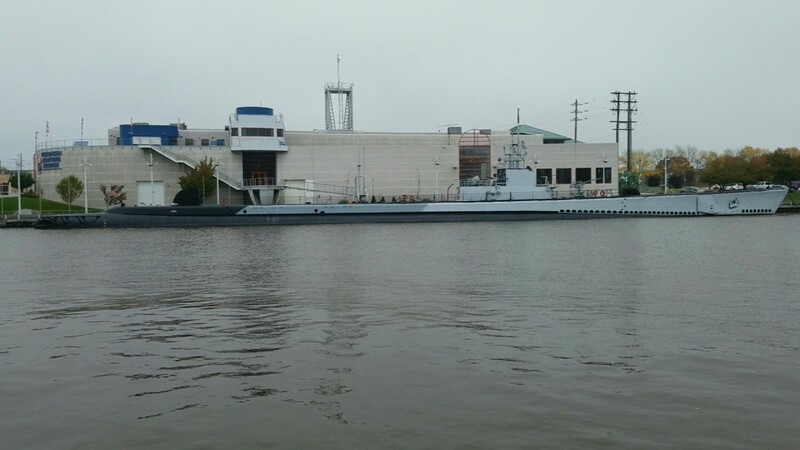 The use of ELF transmissions would allow for the U.S. Navy to keep their nuclear submarines submerged and still be able to receive a message without being susceptible to attack from enemy ships or aircraft (Kruger 1). Researchers had started to come up with ideas that certain types of radio waves could penetrate ocean depths in the 1950’s. The U.S. Navy then started its own research that dealt with trying to produce an ELF radio wave that could penetrate into the depths of the oceans. The Navy produced three projects using the concept of ELF transmissions: Sanguine, SEAFARER, and ELF (“Extremely Low Frequency” 2001). The concept behind ELF transmissions is that radio waves would be transmitted using the lower frequency range of 45 to 75 Hz of the radio wave spectrum that would be received by a nuclear submarine after a certain amount of time. ELF transmissions are very reliable and can be received at the extreme depths the nuclear submarines are operating at due to low atmospheric and sea water “attenuation” (Kruger 3). Essentially, the transmission signal from the transmitter doesn’t degrade a significant amount to cause problems at the receiving end due to atmospheric conditions as well as depth of the sea water. Even if the U.S. were to have been hit by a nuclear blast, the signal still wouldn’t degrade when travelling through the blast wave due to the low frequencies (Kruger 2,3). Project Sanguine called for a dispersed set of ELF radio transmission antenna lines totaling 6,000 miles of cable and transmitters that would be buried over 2,500 square miles at a transmission site in Northern WI. (Klessig 19). The lines would be run to a transmitter and grounded at each end resulting in an electric current running through the ground radiating the ELF signal. A similar estimate was conducted for an area in Upper Michigan due to low conductivity of the ground in the region. This would allow the system to survive a direct attack and still be able to transmit message (Klessig 5, 7, 19). Project Sanguine was designed to be able to survive a nuclear attack as well enemy jamming in order to be able send out a retaliatory attack message. The system is only effective if it can still perform its duties at all costs otherwise it is not a “viable deterrent” (Kruger 1). The system was designed to increase message delivery time if any part of the system was destroyed by a nuclear bomb or even if the enemy tried to jam the signal. An enemy would need two jammers to affect the signal at all and the result would only speed up the message signal and decrease the signal strength of the transmission facilities by a small amount (Kruger 27). The Navy created the Sanguine Test Facility in Clam Lake, WI in 1968 near the Chequamegon National Forest as a small scale test of the Sanguine system (Klessig 61). It was built to help test numerous limits associated with ELF transmission to make sure that it would be a viable option for communication. Interference from the antenna can affect neighboring telephone and electric power lines resulting in issues with locals. Research was conducted to find out what effects were caused by the ELF signals and test mitigation techniques that could damper the effects of the interference on the lines (Kruger 29). Eventually, field tests of the system were conducted by sending ELF broadcasts to submarines around the world including under the polar ice cap above the Arctic Circle (“Extremely Low Frequency”, 2001). After going through the research and test results, the U.S. Navy was able to determine that the site would be able to operate efficiently and effectively as a transmitter facility without causing any major effects that could negatively affect the progress of the project. Any electric field strengths radiating from the antennas would be 0.07 Volts per meter. Electric field strength is the voltage difference between two points that are separated by one meter distance. So, 0.07 V/m is a small amount that would not have a profound effect on any surrounding vegetation or wildlife “limiting ecological impacts” (Kruger 29). Any effects from interference with local power and telephone lines were able to be dampened or mitigated. These results satisfied the U.S. Navy’s assumption the facility would pose no threat to society and continued on with the operation of the facility (Kruger 30). Following these results, an ad hoc panel was assembled by the National Academy of Sciences and the National Academy of Engineering in 1973 to determine if the U.S. Navy was correct in its assumptions that the ELF system employed in Project Sanguine would perform as expected. Two papers written by several people questioned whether or not the system would work correctly and whether or not certain technical issues were correctly identified. The panel went through the experimental data obtained from the Wisconsin Test Facility as well as other experts to determine if the arguments brought up in the papers were valid (Booker iii, 1, 14). Several of the big arguments dealt with certain atmospheric related issues such as the effects due to signal noise, attenuation, and signal jamming. “Noise”, or interference, can arise in the wave resulting in an abnormality of the ELF signal as well (Booker 54). The panel found that the effects due to atmospheric noise, signals caused by natural occurring events such thunderstorms, could be important but claimed that atmospheric noise varies depending on location and time. The panel also went through data from the test facility and found that attenuation from the antenna being buried or not was negligible after an argument questioned the effects of attenuation of the signal due to the ground (Booker 17, 55). The panel also touched on the issue of protecting against enemy jamming techniques. Several jamming systems were referenced throughout the panel’s report stating that the enemy would need to use large amounts of power to counter the broadcast signal and effectively make the broadcast signal unreadable. The panel concluded that jamming of the ELF system would be difficult and expensive to do by an enemy and suggested that the ELF system is capable of handling any attempts of enemy jamming (Booker 61-73). The many arguments brought up some questions but the panel eventually agreed that the U.S. Navy was correct in its assumptions that the facility should work as desired based on the results it had received from test facility as well as the data received from the MIT Lincoln Laboratory. (The Lincoln Laboratory also did some studying of the ELF transmissions to study and further understand the effects of ELF transmissions). The panel did go on to say that more tests should be conducted around the world to make ensure the system would operate as expected worldwide (Booker 2). In 1975, Sanguine ended up being replaced by SEAFARER, which was a more efficient design as the site transmitters would be above ground and the transmission cable would be increased from one inch to two inch cable (Klessig 1980). SHELF (or later known as just ELF) was essentially the equivalent of Sanguine but utilized two transmission stations instead of one. The Sanguine Test Facility took years to become operational at a small scale and the U.S. Navy wanted to try and building the full-scale facility somewhere else so they looked to Michigan’s Upper Peninsula (Webbe, 1981). Once Project SEAFARER was being pondered by the U.S. Navy, the department decided to have GTE Sylvania, INC go through the Upper Peninsula to survey the area and provide current geological, environmental, and social data of the region. This was done to help bring up any socioeconomic, physical, and biological issues that would arise from the implementation of the SEAFARER transmission facility within the region (Intro to Data Reports 1). Certain places were deemed “avoidance features” (Right-of-Way 1) within the survey region. These were places where a transmission site and antenna were not suitable or not cost-worthy for implementation such as a lake or archaeological site. Other areas were deemed “right-of-way opportunities” (Right-of-Way 1). These were areas that the antenna lines were able to go without major conflicts arising such the utilization of roads, old railway lines, and telephone lines. These are areas that wouldn’t have as high of cost to place the antenna lines such as those areas needed to be cleared and stabilized for the lines to be implemented (Right-of-Way 1, 4, 5). Once the survey was complete, GTE Sylvania put together a table showing what areas to utilize to minimize costs associated to the implementation of the transmission state. Such costs are: constructions costs that were associated with construction of the facility, mitigation costs that were associated with upgrading surrounding electrical and telephone lines to get rid of interference, operation and maintenance costs associated with maintaining the facility, biological costs associated with the local impact of vegetation and wildlife, and social costs associated with local residential, recreational, and commercial land use and corresponding effects. This would help the U.S. Navy make sure that the facility wouldn’t be causing any problems after it was built and operational and try to be able to get the public to approve of the measure (Right-of-Way 1,2). Unfortunately, Project ELF replaced SEAFARER after residents in Upper Michigan didn’t approve of the project being implemented in the region. 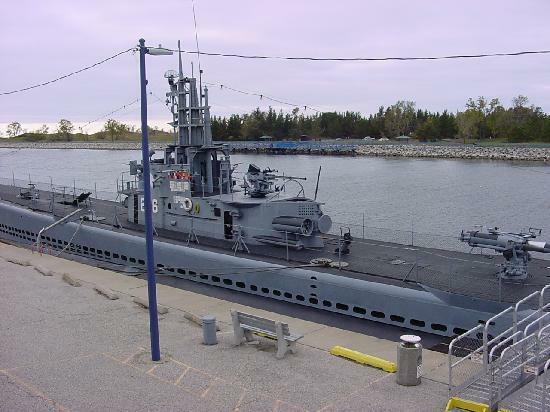 But, after some reworking of SEAFARER that would still allow for sufficient operations, ELF became a scaled down version of SEAFARER that would incorporate the facility already in Clam Lake, WI to work in synchronous with another partner facility in Republic, MI (Klessig 19). To see the scale difference, the original plan called for thousands of wire buried in the ground but was scrapped for a much smaller 56 mile antenna set up that was divided among the two transmission sites (“Extremely Low Frequency” 2001). 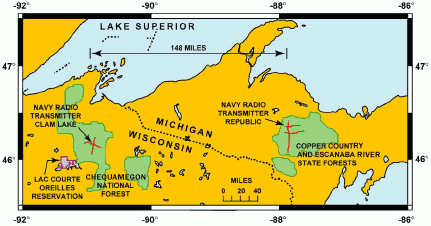 The Navy later renamed the Sanguine Test Facility to the Clam Lake Test Facility soon after the Republic, MI site was chosen to be the partner site due to its similarities to the Clam Lake test facility low conductivity of the surrounding rock formations as well as the fact that the area was secluded with few human settlements nearby (“Extremely Low Frequency”, 2001). In 1985, the Clam Lake facility became operational to a very limited significance. It sent out the first ELF transmission in May that was received by a submarine off the east coast near Florida. For the ELF system to become fully operational and communicate anywhere across the globe, the second site in Republic, MI still needed to be built. In 1989, the Republic site was completed and the ELF communications system came fully online (Altgelt, 2005). The facility was controlled by a detachment of the Naval Computer and Telecommunications Area Master Station Atlantic (NCTAMS LANT) based out of Norfolk, Virginia. Only two NCTAMS LANT civil employees worked at the facility while other contractors were on hand to maintain all of the equipment and antennas. The site was constantly being maintained and inspected with a message being broadcast making sure that submarines would be able to receive and decode a message transmitted (“Extremely Low Frequency”, 2001). The Clam Lake facility operated until early 2003 due to the technology becoming “obsolete and outdated” (LaForge 2004). Booker, H. G. and N. R. C. Summary Statement of the Ad Hoc Panel on Sanguine, Department of Defense, Defense Technical Information Center. 1972. EDAW, Inc. Introduction to Data Reports Upper Michigan Region Project SEAFARER. U.S. Naval Electronic Systems Command. 1976. EDAW, Inc. Right-of-Way Opportunities and Avoidance Features of the Upper Michigan Region Project SEAFARER. U.S. Naval Electronic Systems Command. 1976. Kruger, Bodo. Project Sanguine, FBM Command and Control Communications. Department of the Navy, Electronic Systems Command. 1972. “Extremely Low Frequency Transmitter Site Clam Lake, WI.” (2001). The United States Navy Fact File. Klessig, Lowell L. and Victor L. Strite. The ELF Odyssey: National Security Versus Environmental Protection. Boulder, Colorado: Westview Press. 1980. LaForge, John. (17, Sept 2004) Navy Calls It Quits, Announces Shutdown of Project ELF. Nukewatch. Millett, Allan Reed., and Peter Maslowski. For the Common Defense: A Military History of the United States of America. New York: Free, 1994. Webbe, Stephen. (13, Oct 1981) Navy gets go-ahead for new sub communication system. The Christian Science Monitor [Boston, Mass].